Designed to be used as a photography prop for your newborn models, or as a toy doll bed for your American Girl Doll. This bed is 20" Long by 7.5" Wide (inside dimensions for mattress). This set measures 9.5" tall with the bed knobs and is made of solid white pine wood. 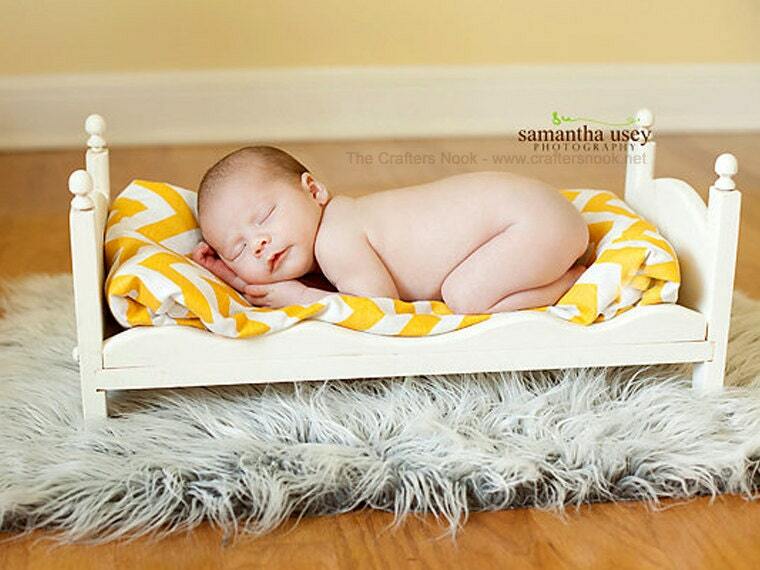 You will receive ONE fully assembled newborn photo prop bed with scallop side railings. * This bed prop will come unfinished and ready to distress or paint. * Buy 2 for newborn twins. Don't forget a ladder! It helps to complete the set. Several photographers have used our small newborn photo prop beds as a more affordable alternative, but we do offer a larger photo prop bed. This newborn photo prop bed comes in different designs/themes. Choose Solid if you do not want a cut out. * Please view the pictures attached to this listing to see the different cut out themes that we have available. This stacking bed is Perfect for Professional photographers, doll collectors, and children. Stack on top of another to create a bunk bed for newborn twins or 2 American Girl dolls. Our beds are handcrafted to be an heirloom keepsake that can be passed down from generation to generation. The Crafters Nook has been selling stackable doll beds on-line since 2003. We take pride in our designs and that our beds are very versatile, can be arranged in a variety of patterns, and stacked or unstacked. Create a bunk bed, triple bunk, quadruple (quad) bunk, quintuple bunk, and sextuple bunk bed set by stacking up to 6 doll beds high! Add a specialized trundle bed for a sleepover or storage....or add our wooden reversible canopy bed, our whimsical design. Love this little bed can't wait to photograph on it!